Skin covers for below knee and above knee prosthetic devices. The best way to finish a prosthesis should be economical, durable and easy to keep clean! 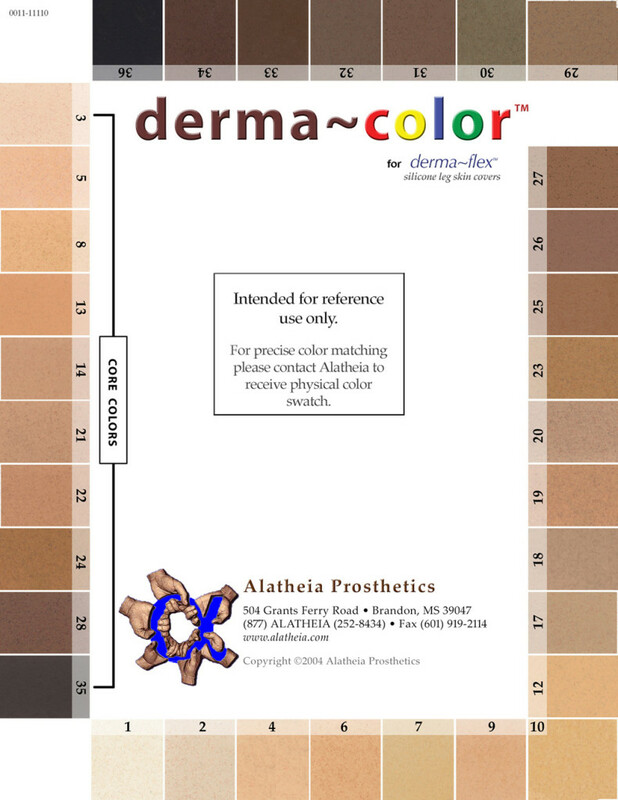 A good protective cover, such as one provided by a Derma-Flex™ Leg skin, is a small price to pay for the assurance that the prosthesis you provide has good anatomical correctness, is durably protected, and is easy to service. A mediocre cover, by contrast, can contribute to patient dissatisfaction due to difficulty to keep clean, or the fact that it looks fake. The irony is that they all cost about the same amount. Consider also what sometimes goes unspoken – patient’s perception of value. If the cover fails them doubts may arise. Let’s face it, if the prosthesis feels good and looks good – it builds confidence. DermaFlex™ Legskins are not made from urethane or vinyl like most but from silicone. There are hundreds of silicone compounds, we specifically use an advanced class of silicones: the ultra-durables. It is also more supple and has greater elasticity. The coloration is all on the inside, so you are viewing the color through a translucent exterior which adds depth and reveals the multi chroma effect much like human skin, instead of a flat solid color.Eliminates the heating, shrinking, mixing, spraying, respirators, cleaning, waiting, etc. Dons in 2 minutes, doffs in 1. A customer explains some benefits of Derma-Flex™ Legskins.